Researchers at University of Utah Health clarified a molecular pathway responsible for the formation of cleft palate and identified a new treatment to reverse this defect in mouse pups in-utero. These findings, published on September 5 in the journal Development, offer a new way to think about cleft development and could potentially yield treatments to prevent this common birth defect in people. "As a clinician, I understand the devastating consequences of cleft palate," said Rena D'Souza, D.D.S., Ph.D., professor of Dentistry at U of U Health. Cleft palate is one of the most common birth defects, affecting 6 in 2,651 children born in the United States. The cleft forms when the bony tissue covering the roof of the mouth fails to join during pregnancy. Children with a cleft palate require reconstructive surgery and complex life-long treatments. D'Souza and her team originally set out to investigate a different tissue: teeth. Using mice as a model, they had planned to clarify the role of two sets of genes – PAX 9 and Wnt genes – in regulating tooth formation. 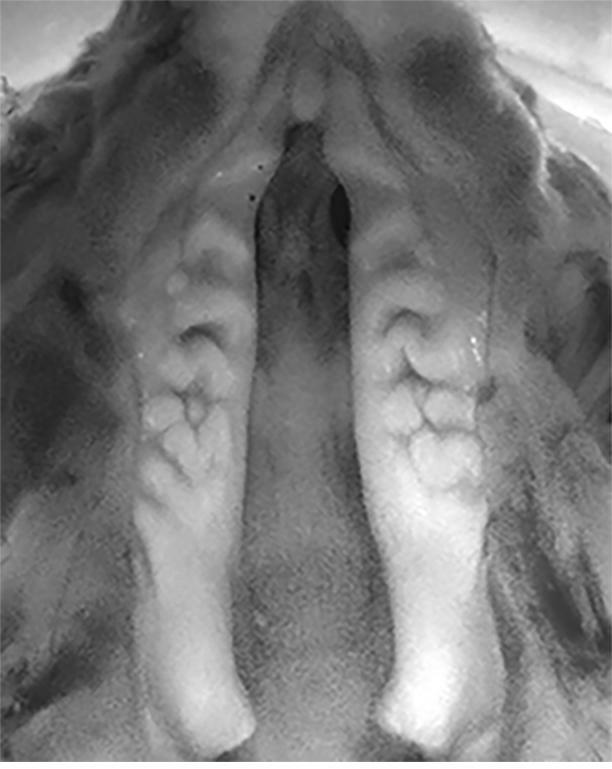 Unexpectedly, their work revealed how the interplay between these two genes at a critical window of development is needed for the palatal shelves to grow and fuse in the midline. "It was really serendipitous," she said. "For the first time, we can show the involvement of the Wnt pathway during palate fusion." Like people born with a cleft palate, the two sides of the palate fail to fuse in mice lacking the gene PAX9. At the molecular level, D'Souza found another abnormality. The mice missing this gene had an increase in two genes, called Dkk1 and Dkk2, that block the Wnt signaling pathway. D'Souza attempted to rectify that change by administering a pharmacological Wnt-based treatment that inhibited Dkk (WAY-262611) intravenously through the mother rat's tail vein during a critical window of the pups' gestation, when palate formation is initiated and ongoing. Treatment restored palate fusion in all of the pups tested. The drug works by blocking the Dkk genes and restoring the Wnt pathway. The researchers found no adverse health effects after monitoring the mother mice and their pups exposed to the treatment for 18-months. Along with cleft defects, PAX9-deficient pups also experience defects in their hind limb, as well as parathyroid and thymus glands. The Wnt-based treatment did not prevent the other defects, and the PAX9-deficient pups soon died after birth. D'Souza believes the premature death is more likely related to abnormal calcium levels, contrary to previous claims that early death was due to malformed palate. D'Souza acknowledges that more work is necessary to ensure the Wnt-based therapy does not affect other organ systems negatively or produce long-term health problems. "These seminal findings are exciting for the field, because Dr. D'Souza and her team have opened an interesting door into potential pharmacological therapies," said Ophir Klein, M.D., Ph.D., Chief of Genetics at the University of California San Francisco. Klein, who is not an author on the study, believes it presents a new strategy for the treatment of single-gene disorders in humans, which can be exploited for new approaches to reverse these defects in humans. D'Souza believes these findings offer some babies born with cleft palate something that was missing before, hope. "Clearly, there is more work to be done prior to implementation for humans, but it seems feasible to translate this research into Wnt-based treatments for people," she said. Future work is necessary to investigate if it is safe and effective to deliver a drug to human babies in-utero or directly to newborns with palate defects. D'Souza conducted this work along with Shihai Jia, Jing Zhou, Christopher Fanelli, and Yinshen Wee at the U of U Health, as well as John Bonds and Gabriele Mues at Texas A&M University and Pascal Schneider at the University of Lausanne, Switzerland. The research received funding from the National Institutes of Health National Institute of Dental and Craniofacial Research and the Swiss National Science Foundation.